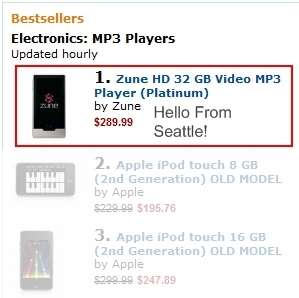 Zune HD #1 At Amazon! This is great news for Microsoft. The Zune HD of course only has two models but clearly this shows there is some excitement for the Zune right now. How long will it last is the big question. Can Microsoft build off of what looks to be a little momentum for the first time in a couple years? Microsoft really needs to do just a few things to really have a strong presense in the market. They simply have to have a larger capacity Zune HD. There is no excuse for the lack of a 64 GB device. That the 32 GB device is selling so well shows people are willing to spend more for a bigger device. They need a small standard player. I know people who just want a little DAP to take to the gym. I have a coworker who won’t consider anything bigger than a Nano. And get this thing out in multiple markets already! Whatever it takes just do it. Sell your soul for it. I don’t know if this would all translate to success but I can’t imagine Microsoft really considers what’s happened up until now a success.